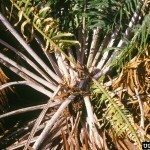 Should I remove all fronds because of freeze damage? I would not do this until you see new growth to replace it. This can kill it to do so.